Objective: To build a database to study the glaciers as climatic indicators and to analyze the glacier contribution to the river runoff. A joint collaboration has been initiated in 2007 between all involved parties through the GLACIOCLIM project. From September 2012 to August 2016, Patrick Wagnon (IRD researcher) has been working in ICIMOD as a visiting scientist and since August 2016, he is in LGGE, but still working on this joined project. GLACIOCLIM (GLACIers, an Observatory of the CLIMate) is a world-wide monitoring network funded by the French government making long-term (> 2 decades) glacio-hydro-meteorological observations on selected glaciers representative of various climatic environments. GLACIOCLIM, a global network for long-term glacio-meteo-hydrological observations. In 2013, this network is >50 years old in the Alps, >20 years old in the Andes, 10 years old in Himalaya and 8 years old in Antarctica. Chhota Shigri Glacier (Himachal Pradesh, India: arid-monsoon transition zone). This glacier has been monitored since 2002, under an IRD-JNU (Jawaharlal Nehru University, Delhi) collaboration and JNU took the lead of this monitoring project in 2013. Mera Glacier (Hinku valley, Nepal: monsoon climate). This debris-free glacier has been monitored since 2007, under a DHM-IRD collaboration first, and then including ICIMOD and NAST. Changri Nup Glacier (Khumbu valley, Nepal: monsoon climate). This debris-covered glacier has been monitored since 2010, under a joint IRD-EvK2CNR/NAST-ICIMOD collaboration. 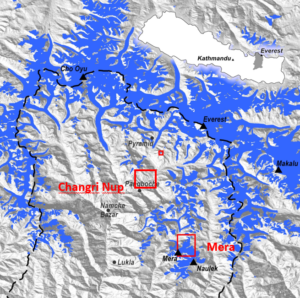 Most of the ablation areas of Nepalese glaciers are debris-covered and Changri Nup Glacier has been selected as a benchmark debris-covered glacier. 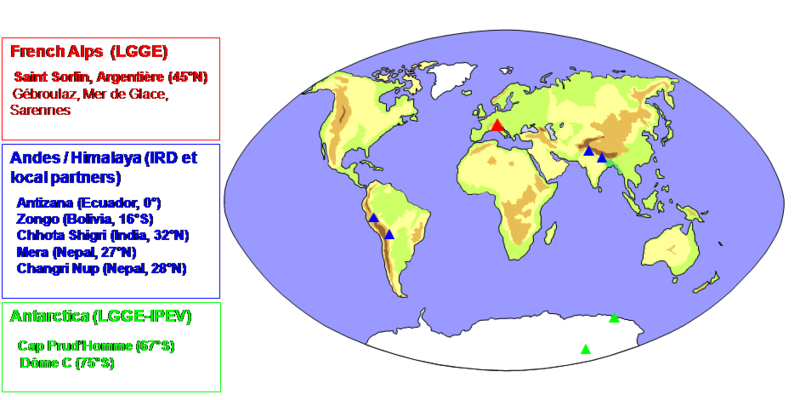 Location of the glaciers monitored in the framework of the GLACIOCLIM-Himalaya project. 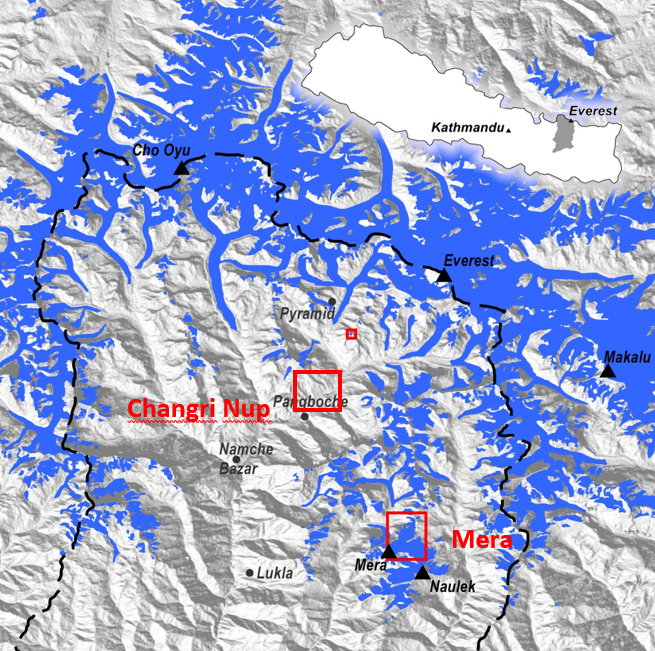 Map of the high Dudh Koshi basin (in grey in the inset Nepal map and with limits represented by the dashed black line in the main map) where Mera and Changri Nup glaciers are located (large red squares). Glaciers are represented in blue. The small red square is Pokalde Glacier where some ablation stakes are also surveyed. (Courtesy E. Berthier). 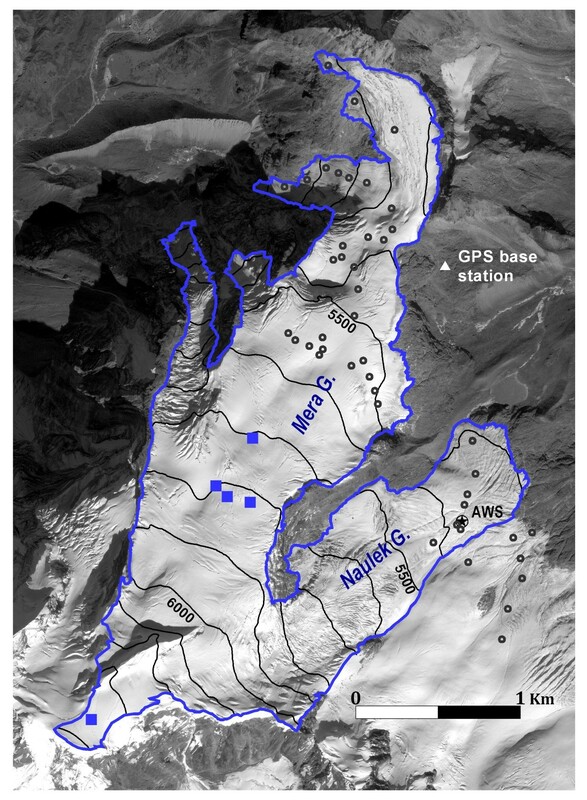 Glaciological monitoring to get the seasonal glacier-wide mass balance (i.e. volume variation) of the glacier. This includes ablation stake measurements, as well as accumulation drillings performed every year, in April and November, at various elevations from the snout to the highest part of the glacier. Meteorological monitoring using automatic weather stations (AWS) located outside the glacier on a nearby moraine to record long-term meteorological trends (Temperature, short-wave and long-wave radiations, humidity, precipitation, wind speed, atmospheric pressure…) as well as on the glacier surface in the middle of the ablation zone to understand the processes governing the melt. DGPS measurements are performed every year in November/December to get the annual displacement of every ablation stake (annual surface velocity), and to measure the annual thickness change at different transversal profiles selected at various elevations. Map of Mera Glacier showing the ablation stake network (black circles), the accumulation sites (blue squares) and the AWS at 5360 m a.s.l. This glacier is 5 km2, flows from 6430 m to 4950 m a.s.l. and is mostly North orientated. (Courtesy E. Berthier). 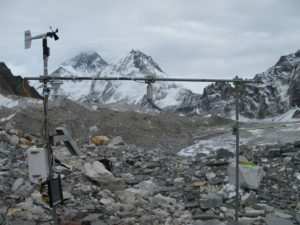 Installation of an ablation stake on Changri Nup Glacier, October 2010. Everest is visible in the background (© P. Wagnon). Manual drilling performed at 5800 m a.s.l. to measure the net annual accumulation on Mera Glacier in November 2010 (© P. Wagnon). AWS on Mera Glacier, at 5360 m a.s.l., November 2010. 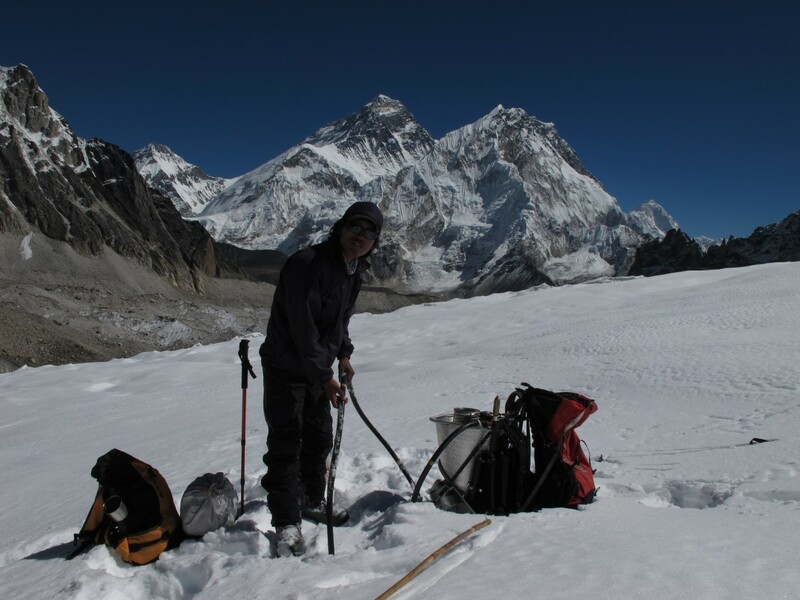 Makalu is visible in the background (© P. Wagnon). AWS on the debris-covered part of Changri Nup Glacier, at 5360 m a.s.l., October 2010. Everest is visible in the background (© P. Wagnon). 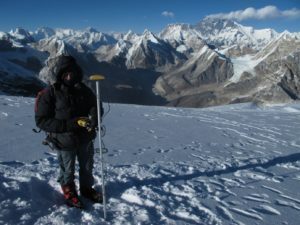 DGPS measurement performed on Mera Glacier, at 6350 m a.s.l., November 2012. Everest is visible in the background (© P. Wagnon). Ground penetrating radar measurements have been conducted in 2009 and 2012 on Mera Glacier, and in 2011 on Changri Nup Glacier (Figure 10). A deep ice core drilling is planned in 2014 or 2015 on Mera Glacier, in order to study the paleo climate of this region. 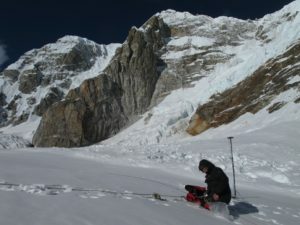 Ground penetrating radar measurement performed on Changri Nup Glacier, at 5500 m a.s.l., November 2011 (© P. Wagnon). 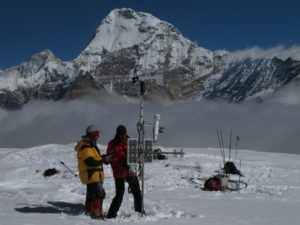 With 14 years of in-situ mass balance monitoring, Chhota Shigri Glacier has one of the longest continuous ground-based mass balance series ever recorded in the Himalayas (e.g. Azam et al., 2012, 2014, 2016). This series has been extended in the past using in-situ geodetic measurements to compare with a map surveyed in 1988. In Lahaul and Spiti Region (Northern India), glaciers have been stable or even have been experiencing a slight mass gain during the nineties before starting to shrink (Vincent et al., 2013). 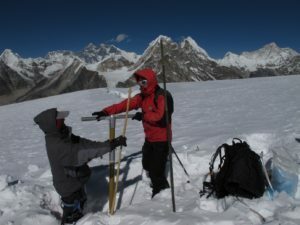 In Nepal, Mera Glacier has the longest mass balance series (Wagnon et al., 2013; Sherpa et al., 2016) and a recent survey in collaboration with Utrecht University on the debris-covered Changri Nup Glacier quantified the reduction of ablation in the ablation zone of the glacier due to the debris cover (Vincent et al., 2016). Azam, F. M., P. Wagnon, A. Ramanathan, C. Vincent, P. Sharma, Y. Arnaud, A. Linda, J. G. Pottakkal, P. Chevallier, V. B. Singh, E. Berthier, From balance to imbalance: a shift in the dynamical behaviour of Chhota Shigri Glacier (Western Himalaya, India), J. Glaciol., 58 (208), 315-324, doi:10.3189/2012JoG11J123, 2012. Azam, F. M., A. Ramanathan, P. Wagnon, C. Vincent, A. Linda, E. Berthier, P. Sharma, A. Mandal, A. Thupstan, V. B. Singh & P. G. Jose, Meteorological conditions, seasonal and annual mass balances of Chhota Shigri Glacier, western Himalaya, India, Annals Glaciol., 71, 328–338, doi:10.3189/2016AoG71A570, 2016. Brun, F., M. Dumont, P. Wagnon, E. Berthier, M. F. Azam, J. M. Shea, P. Sirguey, A. Rabatel & Al. Ramanathan, Seasonal changes of surface albedo of Himalayan glaciers from MODIS data and links with the annual mass balance, The Cryosphere, 9, 341–355, doi:10.5194/tc-9-341-2015, 2015. Brun, F., P. Buri, E. Miles, P. Wagnon, J. Steiner, E. Berthier, S. Ragettli, P. Krajenbriick, W. W. Immerzeel, F. Pellicciotti, Quantifying volume loss from ice cliffs on debris covered glaciers using high resolution terrestrial and aerial photogrammetry, J. Glaciol., In Press. 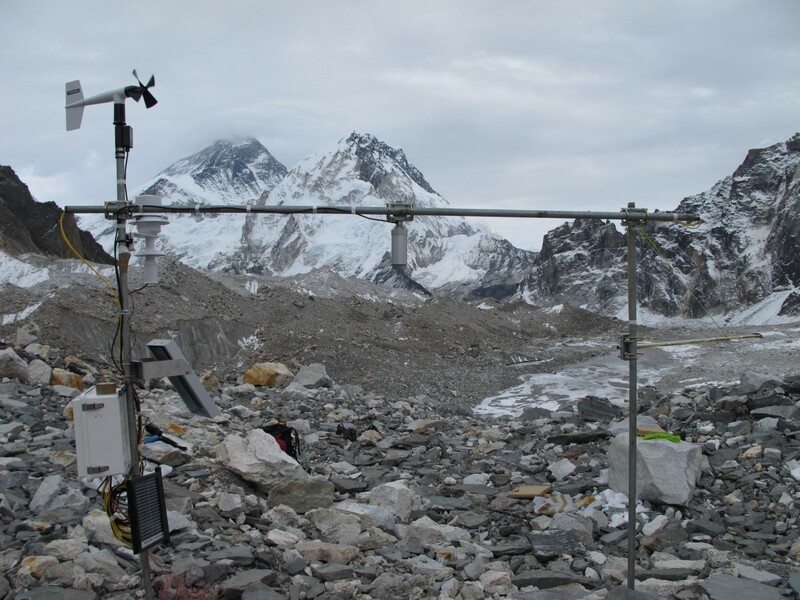 Ginot, P., M. Dumont, S. Lim, N. Patris, J. D. Taupin, P. Wagnon, Y. Arnaud, A Marinoni, P. Bonasoni & P. Laj, A 10-yr record of Black carbon and dust from Mera Peak ice core record (Nepal): variability and potential impact on Himalayan glacier melting, The Cryosphere, 8, 1479–1496, doi:10.5194/tc-8-1479-2014, 2014. Lejeune, Y., J. M. Bertrand, P. Wagnon & S. Morin, A physically based model for the year-round energy and mass balance of debris-covered glaciers, J. Glaciol, 59(214), doi: 10.3189/2013JoG12J149, 327-344, 2013. Mukherji, A., D. Molden, S. Nepal, G. Rasul & P. Wagnon, Himalayan waters at the crossroads: issues and challenges, International Journal of Water Research and Development, 31:2, 151-160, DOI: 10.1080/07900627.2015.1040871, 2015. Savéan, M., F. Delclaux; P. Chevallier ; P. Wagnon, N. Gonga Saholiariliva; Rajendra Sharma ; Luc Neppel; Yves Arnaud, Water budget on the Dudh Koshi River (Nepal) : Uncertainties on precipitation, J. Hydrol., 531, 850-862, 2015. 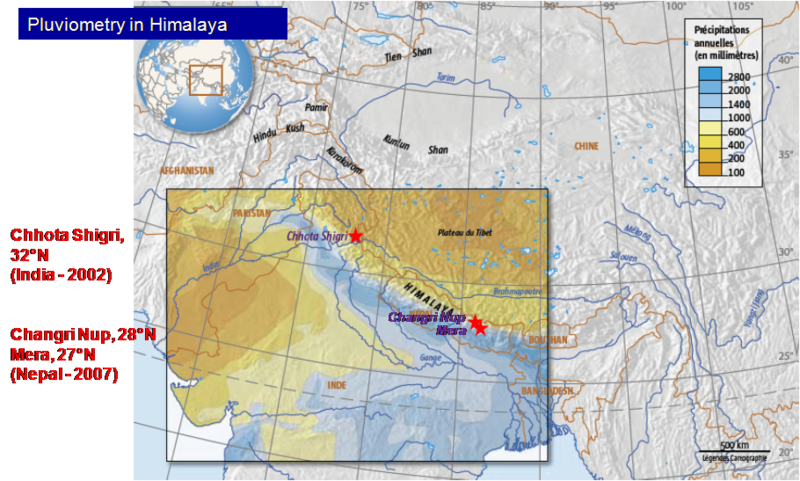 Shea, J M., P. Wagnon, W. W. Immerzeel, R. Biron & F. Brun, A comparative high-altitude meteorological analysis from three catchments in the Nepal Himalaya, International Journal of Water Research and Development, DOI: 10.1080/07900627.2015.1020417, 2015. Shea, J., W. W. Immerzeel, P. Wagnon, C. Vincent & S. Bajracharya, Modelling glacier change in the Everest, Nepal Himalaya, The Cryosphere, 9, 1105–1128, doi:10.5194/tc-9-1105-2015, 2015. Sherpa, S. F., P. Wagnon, F. Brun, E. Berthier, C. Vincent, Y. Lejeune, Y. Arnaud, R. Kayastha, A. Sinisalo, Contrasted glacier mass balance between the southern and the inner part of Everest region revealed by in-situ measurements since 2007, J. Glaciol, to be submitted in Sep. 2016. Vincent, C., Al. Ramanathan, P. Wagnon, D.P. Dobhal, A. Linda, E. Berthier, P. Sharma, Y. Arnaud, M. F. Azam, P.G. Jose & J. Gardelle, Balanced conditions or slight mass gain of glaciers in the Lahaul and Spiti region (Northern India, Himalaya) during the nineties preceded glacier shrinkage, The Cryosphere, 7, 1–14, doi:10.5194/tc-7-1-2013, 2013. Wagnon, P., A. Linda, Y. Arnaud, R. Kumar, P. Sharma, C. Vincent, J. Pottakal, E. Berthier, A. Ramanathan, S.I; Hasnain & P. Chevallier, Four years of mass balance of Chhota Shigri glacier (Himachal Pradesh, India), a new benchmark glacier in western Himalaya, J. Glaciol., 53(183), 603-610, 2007. Wagnon, P., C. Vincent, Y. Arnaud, E. Berthier, E. Vuillermoz, S. Gruber, M. Ménégoz, A. Gilbert, M. Dumont, J. Shea, D. Stumm & B. K. Pokhrel, Seasonal and annual mass balances of Mera and Pokalde glaciers (Nepal Himalaya) since 2007, The Cryosphere, 7, 1769-1786, doi:10.5194/tc-7-1769-2013, 2013.